GetEducated.com, LLC, http://www.geteducated.com, has released its national affordability rankings of colleges that offer the best values in online bachelor degrees in psychology, social science and human services. Colorado State University-Pueblo ranks first among the Top 28 Best Buys in Online College Degrees for its distance bachelor's in social science and sociology, priced at $18,000 (far less than the average online bachelor's in this career area, which costs $40,676). As with residential colleges, the best values in online education come from public universities. Among the most expensive online degrees for human service professionals: Drexel University (Pennsylvania) ($104,000) and Mercy College (New York) ($78,000), both private universities. The online college rankings are based on a survey of 41 regionally accredited universities that offer 84 distance learning bachelor's degrees in human service career areas. 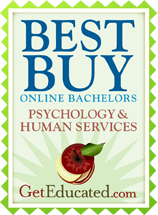 GetEducated.com, a consumer advocacy group that reviews, rates and ranks online colleges for cost and credibility, has released its list of the Top 28 Best Values in Online Colleges that offer bachelor degrees in psychology, human services and social services. The online college affordability rankings are based on a survey of 41 regionally accredited universities that offer bachelor's degrees via distance learning. Colorado State University-Pueblo ranked #1 on GetEducated.com's affordability rankings for its distance bachelor's degrees in social science and sociology. Students will pay under $18,000 for a four-year degree completed through distance learning. State of residency does not make a difference in the distance learning tuition rate at CSU-Pueblo. Florida State University's online bachelor's in interdisciplinary social sciences ranked number two as the most affordable option for Florida residents at just under $20,000. Out-of-state residents will pay significantly more-over $77,000-for this same degree. Adams State College of Colorado was rated number three at an estimated tuition of just under $20,000 for all online students. By comparison, the average cost for a distance learning bachelor's in psychology or a human services career came in at $40,676. Only one college on the Best Buy list was a private school: Columbia College of Missouri. That school, founded in 1851, is a non-profit institution. The survey revealed that the most expensive distance degrees for human service professionals come from Drexel University, at over $104,000, and Mercy College (New York), at over $78,000. Both are private colleges with residential campuses. "Online education is all about making education accessible, especially for working adults in need of a career education," comments GetEducated.com's founder and chief education analyst, Vicky Phillips. "College cost is a huge inhibiting factor for many Americans. The Top Ranked Best Values in Online Colleges should be lauded for taking the initiative in making higher education more affordable, and therefore more accessible, for online students nationwide." Consumers can review, rate and compare all their accredited online education options by cost, public perception, and verified student satisfaction by visiting GetEducated.com's directory of online colleges.